I was at a festival this weekend working at front of house and decided to record one of the bands with the built in mic on my sansa clip+ for interest sake. Actual sound levels were around 97dB. In the recording (and on the level meter on the screen) the level would not exceed -13.4dBFS. It's as if the sound is being hard limited. Reducing the gain brought the recording level down as will as the brick wall, and increasing the gain just pushed the levels harder against the -13.4dB limit. Why is this? Compression is disabled. I believe I'm seeing the same behavior on my Sansa Fuzev2 with latest build regardless of FM or mic source. That means you're running a pretty old build. Pretty sure I fixed this bug months ago. Try updating and see if its still there. Shall do and post update here when I'm back in town. You'll also see the aliasing that I reported on in the general forum. Don't think so... My recording didn't clip with a 97dB source, just the recording level was low. This comment talks about automatic gain control, which is what I think prevented clipping. 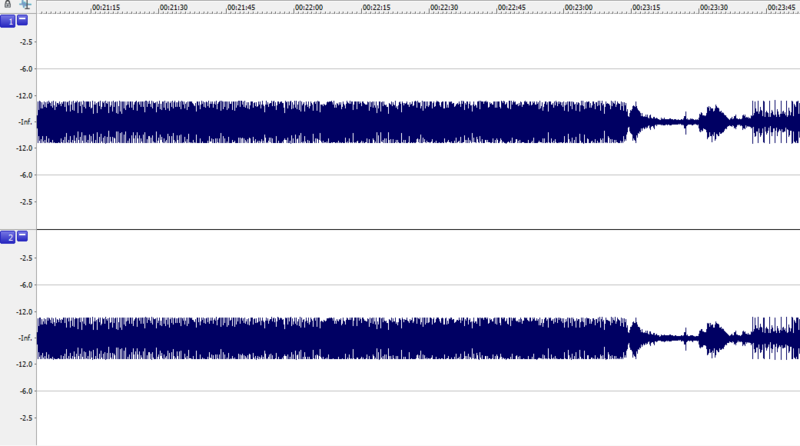 However, now it's a buzzing sound, not clearly visible in the waveform. Perhaps inaccuracies in the ADC? EDIT: If the buzzing was gone, the waveform wouldn't look any different. My apologies. Just read through the post (and comments) thoroughly and see that it is in fact the same issue, or has at least evolved into the same issue. Using the 3.9.1 release and setting gain lower is the most acceptable solution for now(further setting sample rate above 64kHz is required to avoid audible aliasing IME). It's unfortunate, but it looks like the problem was just made worse. Low level is preferable to noisy recordings. Looks like I'll also be reverting back to the previous version until this has been figured out. EDIT:Despite my whining and moaning recording is a ton better now than perviously. Set 'gain' to 0dB and enjoy! Just downloaded r31354-111218 and recording is working perfectly. No noise and recordings can hit 0dB. Could a moderator please lock this thread? Locking at request of OP.